Here's a few of my favorite book-themed gifts that your bookish significant other will love to get on Valentine's Day. Oh yeah, and dinner, flowers, and massages always work too. I've loved OutOfPrint's book cover shirts since the business first started, and it's refreshing to see that they've added more Black authors to their line up. 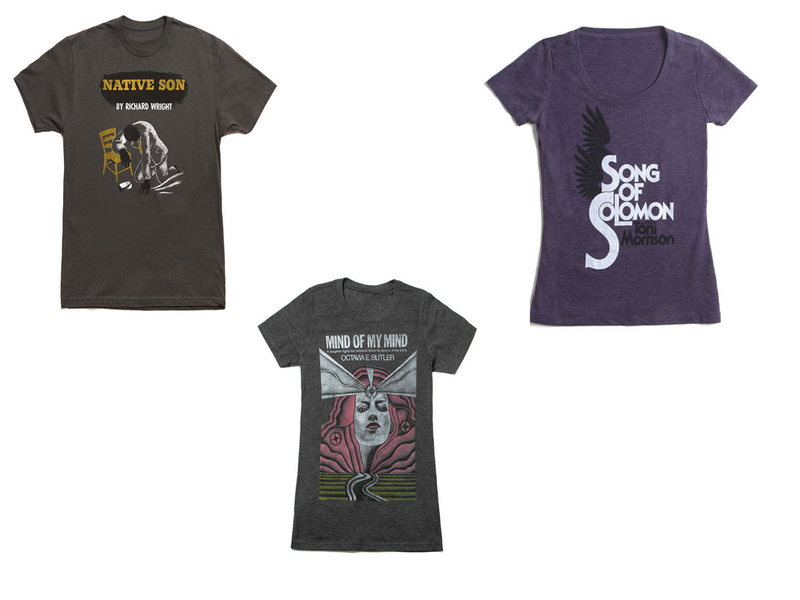 These shirts come in both men's and women's sizes, and they're addictive. I'm eyeing that Song of Solomon one as we speak. So this one is pretty pricey, but the thoughtfulness that this gift requires is sure to score some points. Pick 10 to 15 books that are your bae's faves, and artist Jane Mount will create a custom painting that will add a nice touch over a couch or in the bedroom. You can also pick from pre-painted paintings as well. The one pictured above is Southern Literature. If you're doing it big this year, this is your gift. What's sexier than a man in a crisp suit? That would be a man in a crisp suit with literary devices on his cuff links. Philadelphia Print Works is another one of my favorite t-shirt designers, and I already have the tank that matches this tote. If any men are reading this, yes, this is another gift that will get you some points. You'll get extra credit if you can name at least one work by each writer listed on the bag. Every bookish person relates to the feeling that comes over us when someone asks to borrow a book from our collections. Some of us would rather lend money than books. This personal library kit helps others recognize how seriously your bae takes his or her collection. Fines are optional ( but I highly recommend them). What are you buying for your bookish significant other this Valentine's Day?